An excessively large forehead or a high hairline is a common problem for many men, and a problem that affects roughly 20-25% of all women. For many patients, this problem is caused by genetic factures, hair loss, and of course aging. A high hairline which shows more forehead than most would like, can lead to a low self-esteem and leave individuals feeling self-conscious. It can also detract from other facial features resulting in a less than desirable facial harmony. Hairline Lowering surgery, also known as forehead reduction surgery, is a surgical procedure that is performed by Dr. Andrew Jacono to help reduce the appearance of a large forehead or a high hairline. Dr. Jacono is a leading facial plastic surgeon in New York who specializes in surgical and non-surgical procedures to help create natural beauty and facial harmony for his patients. He is double board certified and considered by many to be one of the top surgeons in the world. 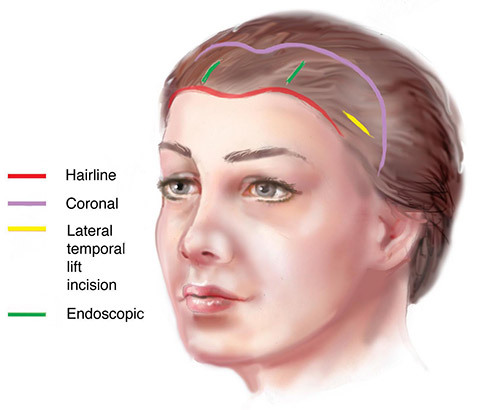 Forehead reduction surgery or hairline lowering surgery can be used to reduce an excessively high hairline or large forehead in both men and women. Dr. Jacono uses two very different approaches when treating patients who are suffering with this issue. One of his approaches is to surgically lower the hairline by moving the scalp forward and then removing the excess skin. His second technique involves grafting hair follicles from the patient within the hairline and forehead region to make the appearance of a smaller forehead. For patients who are undergoing the hairline lowering surgery option, Dr. Jacono will excise a strip of your forehead skin just before your actual hairline. Because the incision is placed just before the current hairline, the scar will be less visible. Dr. Jacono’s vast knowledge of scar reduction techniques and his minimally invasive surgical approach help ensure that patient results look natural with little or no visible scarring. Patients who decide to lower their hairline using transplanted hair follicles will undergo a Neograft hair transplantation. This procedure involves harvesting healthy hair follicles from the donor area (usually the back of the head or side areas) and grafting those follicles into the hairline region to create a denser and lower hairline. Learn more about Neograft hair transplants. Most patients see an immediate result following the surgery and can usually return back to work after a period of two weeks. During the recovery process, it is important to follow all of Dr. Jacono’s directions to ensure a proper healing and the best surgical results. Patients will typically experience a numbness at the incision area which can last a few weeks. A tight wrap will be placed around the forehead area following the procedure to help ensure there is no excessive swelling. A cold compress should be used over the next few days to help keep the swelling down. Most patients experience a minimal discomfort or pain at the incision site. This can be controlled using pain medication that will be prescribed by Dr. Jacono. Most patients do not require the pain medication and the first day or so. After a period of 5 to 7 days, Dr. Jacono will remove your stitches. Am I a Candidate for Forehead Reduction or Hairline Lowering Surgery? Men and women who are self-conscious about the appearance of a large forehead or high hairline may be a good candidate for this procedure. It is important that patients are in good general health and are non-smokers. Candidates who smoke should consider quitting a few weeks prior to the procedure as the healing process and the surgical results can be negatively affected. The first step to determining if you are a good candidate is to schedule a consultation with Dr. Jacono. During the consultation process, Dr. Jacono will be able to examine your hairline and forehead region to determine if this is the right procedure that matches with your outcome goals. To learn more about forehead reduction / hairline lowering surgery or to schedule your consultation, please fill out our complimentary online consultation form. If you prefer to speak with one of our patient care specialists, please call 516-773-4646 for our Long Island office or 212-570-2500 for our New York City location.